The global mass spectrometer market was valued at US$ 5,474.7 Mn in 2017and is anticipated to register a stable CAGR of 7.7% during the forecast period 2018 to 2026, according to a new report published by Transparency Market Research (TMR) titled “Mass Spectrometer Market– Global Industry Analysis, Size, Share, Growth, Trends, and Forecast, 2018–2026.” Growth in the pharmaceutical and life science markets, rise in demand for clinical analysis, increase in mergers and acquisitions, and increase in food and beverage testing has increased the penetration and growth of the mass spectrometer market globally. The market in North America is expanding at a significant CAGR of 8.3% on the backdrop of numerous technological innovations in advanced laboratory equipment. 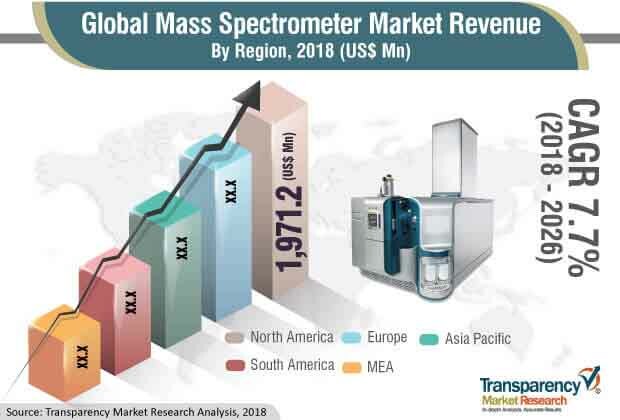 The global mass spectrometer market by product type is segmented broadly into five major segments, namely gas chromatography-MS, liquid chromatography-MS, MALDI-TOF, ICP-MS (inductively coupled plasma-mass spectrometry) and others. In terms of revenue, MALDI-TOF was the largest contributor to the market, followed by liquid chromatography-MS in 2017 due to the growing adoption of MALADI-ToF mass spectrometer as it offers accurate mass measurements and reduced time for analysis. Currently, the use of this technique in clinical microbiology laboratories is growing in order to replace or complement conventional laboratory identification techniques as it provides easy, rapid, high throughput, low-cost, and efficient identification techniques. MALDI-TOF segment is projected to expand at a significant CAGR of 8.0% over the forecast period. Key trends prevalent in the mass spectrometer market are use of refurbished instruments, miniaturization of mass spectrometers, increasing investments by governments and research institutes, launch of technologically advance mass spectrometers, increasing research activities, and increasing mergers and acquisitions. Mass spectrometer is a powerful analytical tool for both quantitative and qualitative applications. Mass spectrometers are increasingly used in the field of pharmaceuticals as it offers new instrumentation and ionization techniques that can be used to solve various difficult bio analytical problems, thereby driving the growth of the mass spectrometer market globally.Mass spectrometer is used for the optimization and monitoring of fundamental chemical processes used in the manufacture of various pharmaceutical and life science products. In 2017, the pharmaceuticals segment accounted for the largest market share. Biotechnology segment is also expected to expand at a significant CAGR throughout the forecast period. Mass spectrometry is becoming popular in biotechnology applications. Mass spectrometer provides accurate measurements and real-time information regarding culture respiration and the availability of nutrients. Geographically, the global mass spectrometer market is divided into five major geographical regions. These include North America, Europe, Asia Pacific, South America, and Middle East & Africa. In 2017, North America was the topmost revenue generating region followed by Europe.This is mainly attributed to growth in demand for mass spectrometers in the pharmaceutical industry in the U.S. and Canada. The U.S. held highest market share in 2017 in North America and is estimated to expand at the highest CAGR during the forecast period.The market in Europe is anticipated to grow at a significant CAGR during the forecast period due to high penetration of mass spectrometers in industrial and non-industrial research sectors.The mass spectrometer market in Asia Pacific is expected to expand at the highest CAGR of 8.5% over the forecast period. Factors such as growing technological innovations and popularity of conventional biological laboratories and increasing R&D investment in pharmaceutical industry are expected to drive the Asia Pacific mass spectrometer market. The company profiling of key players in the global mass spectrometer market includes company overview, major business strategies adopted, SWOT analysis, and market revenue for years 2015 to 2017. The key players profiled in the global mass spectrometer market report includes Bio-Rad Laboratories, Inc.,Agilent Technologies,Waters Corporation, Bruker Corporation, Thermo Fisher Scientific Inc., Shimadzu Corporation, PerkinElmer Inc., Charles River Laboratories International, Inc.,bioMérieux SA, and AB Sciex (Danaher Corporation). Players are introducing technologically advanced mass spectrometers and establishing partnerships with other players to meet the continuously growing demand for accurate and real time measurements.